I'm so pleased: the Smaller Person actually wanted to take part in this craft! I think it was the large glittery heart which drew him in. This is so simple and fun to do. First fold your A4 sheet in half to create your card base. Cut small heart shapes through the layers of all of your tissue paper. They don't have to be perfect - don't worry! 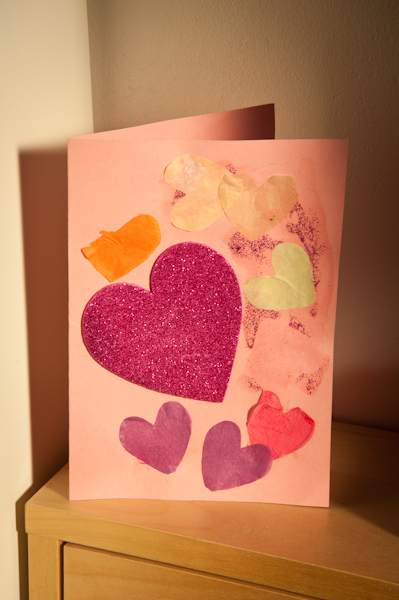 Put glue over your card base and stick tissue paper hearts everywhere, any way up, overlapping or not. Now glue your foam heart shape over the top of your tissue paper heart beckground. Add a bit more glue and sprinkle with plenty of glitter. Now all you need to do is write a lovely message inside for a loved one. The Smaller Person has made his for the Small Person. He really loves his big sister. You could make pretty patterns with the glue before adding the glitter and you could add a little message to the front.